I'm not a real Amazon.com, Target, iTunes person. I like thrift stores, used book shops and record (CD) stores. I like to wander and wonder at all things there. Golden Oldies supplied me with hundreds of CDs. I don't save money, hell I'm more likely to buy a couple books I didn't know I wanted in addition to the one I went in for, if I found it. So this is sad news. If you are one of those few remaining souls who still gets music the old-fashioned way, and if you live in one of the twenty states home to at least one of Tower Records's eighty-nine American stores, chances are you've heard the news: Tower, the last and largest of the great "brick-and-mortar" record store chains, is going out of business. 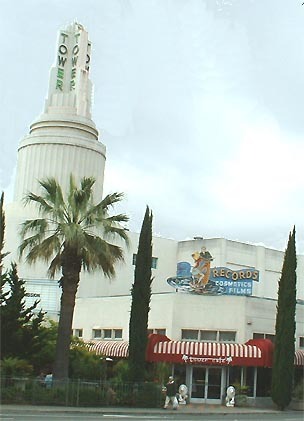 BTW, pic is of the original Tower Records shop.